Left | Something should go here, maybe later. This is probably the most astute (yet simple) explanation of Liberal politics I’ve seen. Aaron Worthing at Patterico posts on violence in American politics. The fact is the left is neck deep in hypocrisy on this. Besides Gladney and the other woman attacked at the Paul-Conway debate, every time the G8 meets anywhere, there are violent protests to say the least, and just the other day the GOP HQ in Denver was vandalized. Every time unions go on strike, especially the Teamsters, you can expect violence. And do I have to remind you of the very credible allegation that Charlie Wilson beat his wife? And police recently linked together the shootings at the Pentagon and the National Museum of the Marine Corps, and there is a third shooting at the Marine recruiting station in Chantilly, Virginia (that is fairly close to the other two). I bet that is some right-wing extremist doing that, right? So let’s not pretend that one side is Bull Connor and the other side is Martin Luther King, okay? However there have been several incidents both before and after this incident where people attending tea party events have been attacked. While I’m at it, before the last election Gateway Pundit (along with a bus load of Republicans) was almost killed when a lefty threw a bag load of cement off a motorway overpass. Anyway, read the whole thing etc, etc. Oh, and he links to this Althouse post. 1. One data point proves nothing about a large group (unless you follow the thinking style of bigotry). 2. The “violent Tea Party” meme has been pushed since the very beginning of the Tea Party movement, so it’s nothing new. And the failure to pick up enough data points to look anything like a pattern is glaringly obvious. 3. The MoveOn.org woman came to the event to create an incident and caused the Ron Paul’s supporters to worry about his safety, so that violent incident was prompted by the urge to defend, in which case even that one incident isn’t a data point that fits the gapingly empty template. As I’ve said time and time again, no one is claiming there are no idiots, racists, or violent people on the right. However, to claim that it’s only the right that has idiots is simply wrong and if anything, the boot is on the other foot. You don’t see the right rioting when the Democrats have their convention – you see the left rioting at the Republican and Democratic party conventions. Update: Liberty Scott coveres much the same terrotory, but from the UK perspective. Do those on the left really believe their vacuous rhetoric that those who are not on the left hate the poor, want them to suffer and (in the case of Toynbee’s vile but carefully chosen words) want them exterminated? As much as I oppose the welfare state it is not motivated by hatred or disinterest in those who are worse off than myself. Even the trimming of the welfare state being implemented in the UK (largely about those who are on higher incomes claiming benefits and those claiming more than the average wage in total benefits) are seen as being a “savage attack” on the poor. The left does not have a monopoly on compassion, indeed the speed and voracity at which it turns on those who dare to disagree with its solutions shows how shallow that “compassion” actually is. How many on the left talk of dancing on Margaret Thatcher’s grave, how many on the right talk the same about Tony Benn, George Galloway or Arthur Scargill? Any chance we’ll see this level of outrage directed at Glenn Beck for unquestioningly airing an apparently fraudulent tape in order to portray an ACORN employee as a murderer? Beck has, after all, been pretty clear that he is trying to bring ACORN down. …when they edited the questions out of the clip. In fact, Beck has quite a few questions that no one seems interested in asking. How can you do that with a straight face? How can you retain credibility? Tell me if I’m wrong here. Well, looking at the comments on this CNN report it seems that the media have managed to succeed in their agenda. Timothy McVeigh returned from the gulf war, fell in with right-wing ideology and killed 168 patriotic Americans. Are all soldiers a threat? Of course not, but if we have another terrorist attack on US soil, it’s probably going to come from there. Why do I say that this comment is the result of a media beatup? Please welcome Daniel Andreas San Diego (shown at right in photos via FBI.gov) to the Federal Bureau of Investigation’s Most Wanted Terrorists list – notably, the only domestic terrorist on that list. San Diego is wanted by the FBI for “his alleged involvement in the bombing of two office buildings in the San Francisco, California, area.” Apparently, San Diego is suspected of being involved with two explosions at the Chiron Corporation in Emeryville – a corporation which the FBI says has had business ties to Huntingdon Life Sciences. If you’ve read the report on left-wing extremism, that company is a top priority for left-wing extremists. Animal rights and environmental extremism pose a significant domestic terror threat. To date, extremists have been responsible for more than 1,800 criminal acts and more than $110 million in damages. Currently, we are investigating approximately 170 such extremist incidents across the country. So let’s sum this up: When the media talks about Timothy McVeigh, they’re citing one horrific act of a madman as an example of the evil right-wing extremists. But they pass over one hundred seventy left-wing extremist incidents by failing to cite a single one of these examples. That’s right. The media are focusing on the risks outlined in a report on right wing extremists. That report ” focuses on standard beliefs as evidence of extremism” to quote Patterico. At the same time, the media completely ignored a report that outlined left wing extremisim. Unlike the right wing version, it actually names actual groups and actual threats. But clearly at least one member of the public now thinks that “it’s probably going to come from” the right, because that’s all the evidence he’s been presented with is saying, even thought the actual evidence says exactly the opposite. Also, the committee should recommend a small amount of extra public funding for election years to secure political support for the crucial ban on anonymous donations (over $250 or $500) and indirect donations. Is he actually suggesting that the government pay off other political parties to get their support on an issue? Sounds like it to me. I was reading this article on MandM’s blog, and it really struck a chord. I’ve included the proceeding 2 paragraphs for context. We need to remember that kiwisaver is taxpayer funded. What does this mean? It means that kiwisaver works this way. Person P signs a contract with another person Q where Q agrees to pay P in exchange for labour. The state however, steps in and threatens P, telling him that if he does not give him some of the money he has worked for and is entitled to by contract they will separate him from his wife and kids and lock him up (violate his liberty). In other words Kiwisaver achieves its goals by threatening to violence against others. Threatening to violate there liberty rights if they do not comply. Don’t get me wrong here, I am not an anarchist; I am not saying that the state is never justified in threatening people or taking their life liberty or property. What I do think however is that one needs justification for this. If we are to avoid tyranny, then it cannot be the case that the state can just do this whenever some good consequence or cause would be furthered by doing so. Policies like kiwisaver appear to be premised on the denial of this principle they suggest that merely helping others save is sufficient justification for threatening others with violence. This is why I am not a centrist, and why I am not a leftwinger. While the left claim to be opposed to violence they really are not. They in fact have a very low threshold of opposition to opposing violence and are willing to use it for almost any reason at all. The left tend to oppose violence when its being used against criminals, such is in cases of capital punishment or in just wars where aggressive or tyrannical regimes are being resisted by force. However, when it comes to innocent people, people who have committed no crimes the left will justify violence for almost any reason. If a policy has a good consequence, such as helping people save, or helping a person educate there children, or helping people artists paint a picture, or whatever, they will allow the state to threaten innocent people to do so. I find this morally perverse, justice requires distinguishing between the innocent and the guilty, those who are threatening others and those who are not. A just state concentrates threats of violence and if necessary uses violence against the latter and not the former. The state can collect taxes for this purpose but it cannot threaten people for any reason it likes no matter how socially useful such violence may be. Yet the political left have distorted our culture that people now, apparently in large numbers, will justify threatening their law abiding neighbour to help them save money. I agree wholeheartedly with this, it’s totally perverse how the left ends up punishing the innocent and good and ignores or encourages the evil. The problem is that it is always dressed up as “helping”, and thus usually requires a more involved arguement to take down. I have noticed this in real life too, in my time as a student. The left wing groups frequently used tactics commonly found in less democratic countries without the slightest shame. In fact, a lefty who believed in working within the system was quite rare. I’ll provide a more specific example of what I mean. During student elections, right wing candidates were, and still are expected to follow the election rules to the letter. The slightest infringement leads to disqualification. In fact, I recall hearing about a case in Canterbury a year or two back where an entire ticket was disqualified for the sins of one of their candidates. However, I have also seen left wing candidates break the rules with impunity, and have never once seen any punished, or even investigated. Remove the spin, and what are you left with? Here’s a great quote from IS at No Right Turn. As for why Labour thinks this is a problem, it is worth remembering that they received $315,000 in anonymous funding in the lead-up to the last election – a third of their total. They’re as corrupt and addicted to money as National. Given NRT’s (and a large part of the left’s) automatically assumes that the Right is corrupt (otherwise how would such evil people ever get elected?) saying Labour is “as corrupt” as National is quite a statement. He’s effectively admitting that a government he likes is in power, and planning to stay in power, by corrupt means. Quite a statement for the left to make about themselves. Labour’s own friends are turning on them. Time to go. Then, we have this video from Just Left. It’s quite unremarkable, if you look at what is actually being said and ignore the breathless commentary. But Jordan describes it as a “… look into the kooky world of College Republicans. … Scary stuff”. If it scares you, I suggest you get professional help. If you think it’s kooky, you need a lot of professional help. The claim is that it shows that the College Republicans are “not willing to put their money where their mouth is”. That’s because, of all the people there, none were in Iraq. Yes, that is impossible by definition. So, Labour is as corrupt as National, only more so because they’re writing a law to continue a practice opposed even by those who used it last time, even though they condemned that practice as corrupt many, many times. And republicans are kooky because there are some who are not in the trenches in Iraq. Never mind that thousands are. And they wonder why they loose elections. Socialists crack me up. 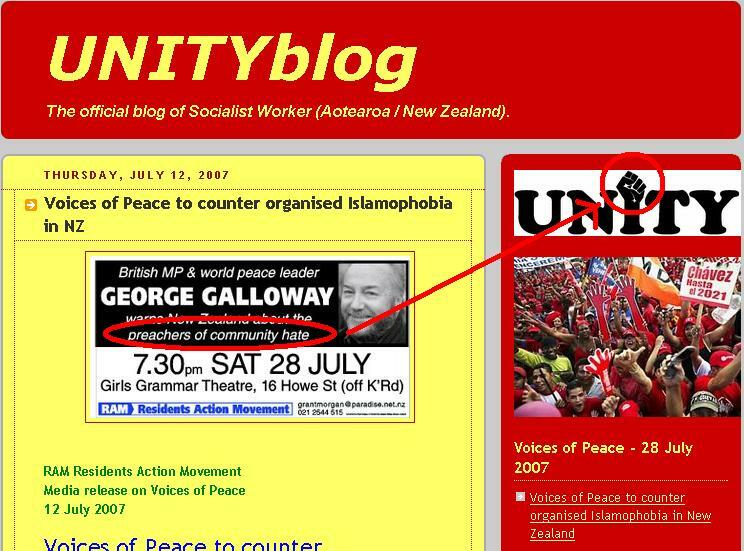 Who else would invite an MP accused of fraud to speak about “preachers of hate”, while having an explicit hate symbol in their own logo? Let me guess, they were infiltrated by capitalists who re-designed their logo while they weren’t looking? James Sleep is back bloggging. I assumed that his parents had caught up with what he was doing and put a stop to it, but maybe not. I would say from my experience that running a blog is not something I would ever let a child do – the spam you get is just diabolical, bottom trawling stuff. I Read a very interesting article in the NZ Herald today from a political scientist that believes the Voting age should really be raised to 35…..I think that is bloody rediculous[sic] personally. But I thought It was very interesting. “That Guy” is well known for his intellectial commentary, so it’s certainly odd to find anyone who thinks his comments are “rediculous”. Clearly James was sent to bed before “Sports Cafe” came on. Perhaps the Herald should follow Jordan’s suggestion? The furthest the rules should perhaps go, is in some kind of non obtrusive note that a piece is satire. Usually it is bloody obvious, but sometimes it’s not. Just to highlight to some of the community who are just not interested in politics, that there is “more than meets the eye!” in the content they are seeing. Heh, it’s been well known for some time that Jordan doesn’t recognise his blog is a joke. Turns out he has trouble recognising any jokes at all.